EB06562 (1µg/ml) staining of HepG2 (A), Jurkat (B), Mouse Brain (C) and Rat Brain (D) lysates (35µg protein in RIPA buffer). Primary incubation was 1 hour. Detected by chemiluminescence. HEK293 overexpressing AKT3 (RC224750) and probed with EB06562 (mock transfection in second lane), tested by Origene. 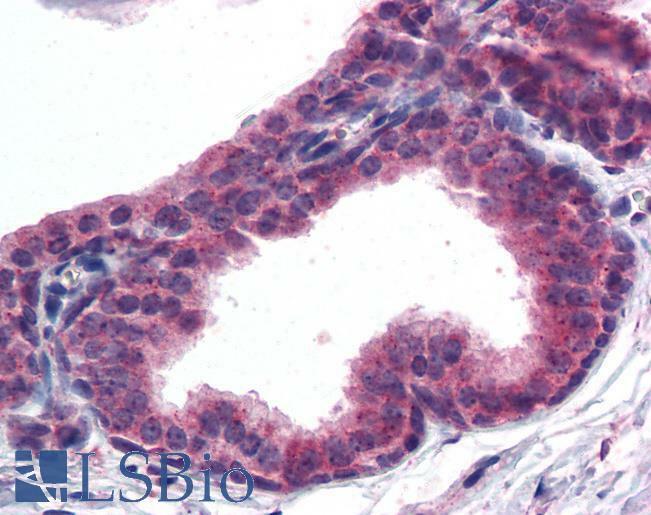 EB06562 (5µg/ml) staining of paraffin embedded Human Prostate. Steamed antigen retrieval with citrate buffer pH 6, AP-staining. 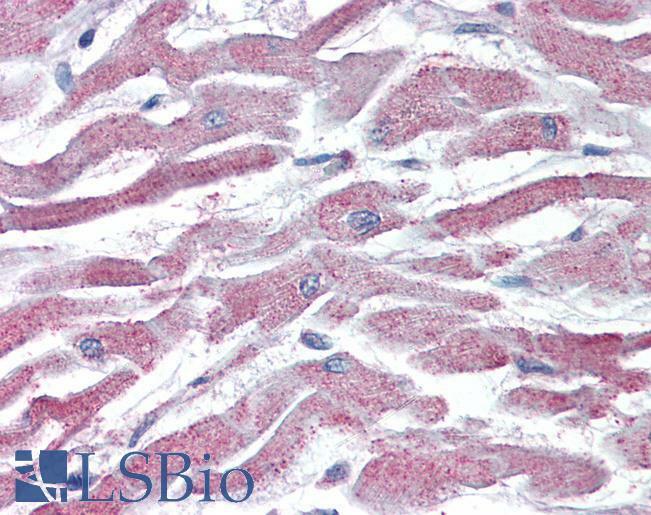 EB06562 (5µg/ml) staining of paraffin embedded Human Heart. Steamed antigen retrieval with citrate buffer pH 6, AP-staining. Important Comments: This antibody is expected to recognise an epitope corresponding to aa 119-133 of both isoforms of human AKT3 protein. 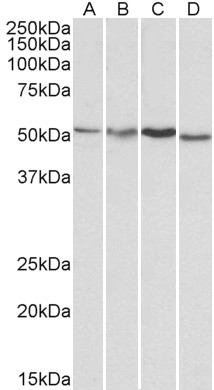 This antibody does not cross-react with human AKT1/2. Reported variants represent identical protein (NP_859029.1; NP_001193658.1). Peptide with sequence CSPTSQIDNIGEEEM, from the internal region of the protein sequence according to NP_005456.1; NP_859029.1. Western blot: A 50-55kDa band observed in lysates of cell lines HepG2 and Jurkat and in Mouse and Rat Brain lysates (calculated MW of 54.0kDa according to NP_859029.1). Recommended concentration: 1-3µg/ml. IHC: Paraffin embedded Human Prostate and Heart. Recommended concentration: 5µg/ml.